The invention of the sport of Volleyball is credited to a YMCA instructor in Massachusetts in 1895. William G. Morgan combined his knowledge of the sports of baseball, handball, basketball and tennis to structure a game that he called “mintonette,” which was given its modern name of volleyball during a competition the following year. The YMCA remained instrumental in spreading the new sport around the globe, to Asia, Europe, the Caribbean, Brazil and Uruguay during the first part of the 20th century. The NCAA collaborated with the YMCA in forming consistent rules and regulations, and In 1928 the United States Volleyball Association (USVBA) was formed. By 1949 volleyball world championships were being held. Indoor volleyball entered the summer olympics in 1964, and two-person beach volleyball was added to the summer olympics in 1996. Volleyball is a very comprehensive form of exercise for all ages, sexes, ethnicities and demographics. Principally a form of aerobic exercise, volleyball helps to enhance agility and flexibility, as well as muscle tone and stamina. It also helps to hone hand-eye coordination and concentration, as well as balance. Playing volleyball burns calories and fat and promotes cardiovascular health and weight control. With intermittent high-intensity moments during competition, volleyball also helps build muscular and musculoskeletal strength. As with most team sports, volleyball builds a sense of community and aids in confidence, limits depression and stress, and enhances overall mental well-being. While the original incarnations of volleyball were modeled as an indoor sport, like basketball, volleyball lends itself perfectly to being an outdoor recreational activity. Whether in a park, playground, beach or even in the water, all that is needed is a place to put up a net, a ball and a group of friends to enjoy with. 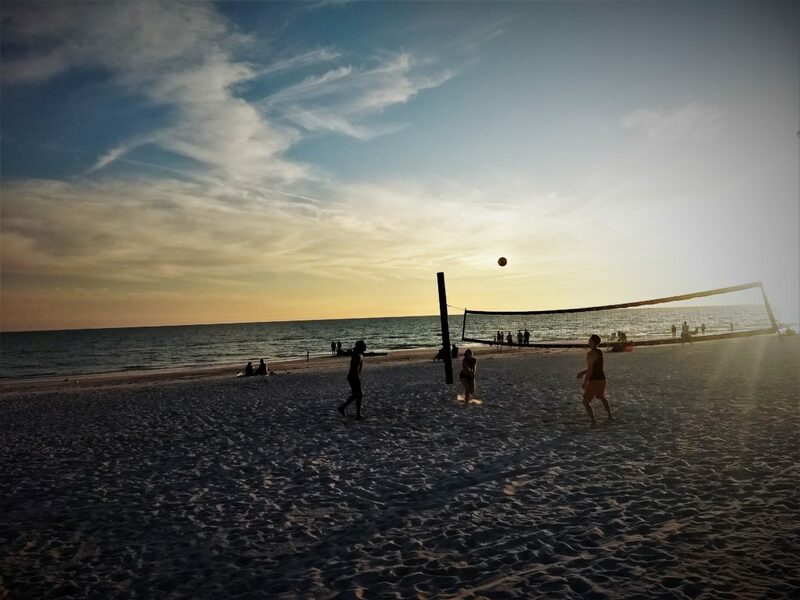 Being outdoors near green spaces or water has been linked to numerous benefits, to body and mind, plus the natural source of vitamin D that comes from the Sun is a great added benefit to playing volleyball outdoors. Of course, if one wants to get very serious about competing in volleyball in the fresh air, they can train daily at the beach, now that beach volleyball is an internationally played competitive sport.